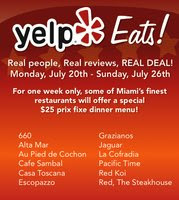 food for thought | a miami food blog: What Do Yelp and Tripe Have in Common? Never eaten chitlins, white boy? Nope - not a staple in my white boy Jewish household growing up. You know anyplace in Miami that serves 'em? While I enjoy good tripe, I'm not a big intestine fan. But on our last trip down to Marumi Sushi in Plantation we tried the Pork Intestine Stew from the Specials list. The broth and vegetables were delicious and the pieces of intestine were tender with just a bit of chew. It's really worth a try if it's available. Rick, thanks for reminding me - as I noted a while ago, I love the motsuni (pork intestine stew) that they occasionally have as a special at Yakko-San. I've heard good things about Marumi, will have to try it if I'm up that way.